Photo of the skimmer in place, provided by UCSO. 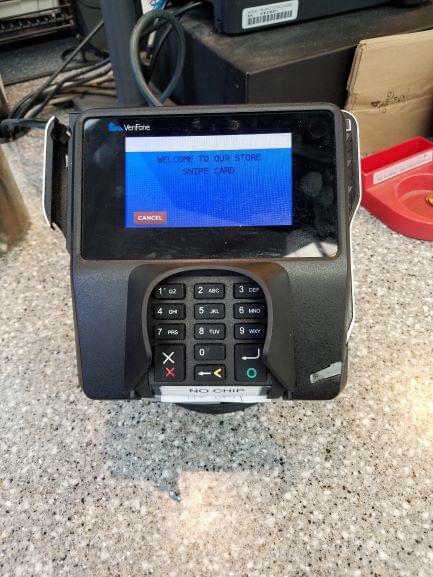 UMATILLA COUNTY, Oregon – An alert clerk at the Space Age store on Oregon Highway 207 just off Interstate 84 near Hermiston called the Umatilla County Sheriff’s Office to report a credit card skimmer was attached to one of their card readers next to the register inside the store. Umatilla County Sheriff Terry Rowan said they don’t know how long the reader had been attached or if anyone was affected. Rowan said that usually the person has to return to retrieve that information. The fake device comprised of a clear screen, a scanner, and a duplicate keypad was affixed to the real card reader with double-sided tape. Inside the device the components include a battery and a device that reads the magnetic strip on the credit or debit card. The keypad captures the PIN numbers. Rowan urges anyone who used plastic to purchase items at the Space Age store to check their bank accounts for any suspicious activity and contact both the bank and the sheriff’s office if they experience a theft. Even though the devices look authentic, people are encouraged to check out card readers before inserting their cards. “Usually, they’re attached with double-sided tape and they will come off with not much effort,” Rowan said. Examine the card reader device and keypad for looseness, cracks, dents, or other damage. People should also be alert to different colors than the actual machine. Cards with chips are less likely to be skimmed.